In many of his concerts, Miles Davis used to play his trumpet facing away from the audience. Would it have made a difference had he faced the audience? Unplugged acoustical instruments can feature a tremendously different timbre for different orientations. Musicians experience such effects while playing their instrument in different environments. Those lacking such experience can only learn about the so-called directivity of musical instruments from publications showing diagrams of measured timbral changes. Comprehensive publications from the nineteen sixties deliver remarkably detailed descriptions. And yet, it requires training to imagine how the timbral changes sound like by just looking at these diagrams. 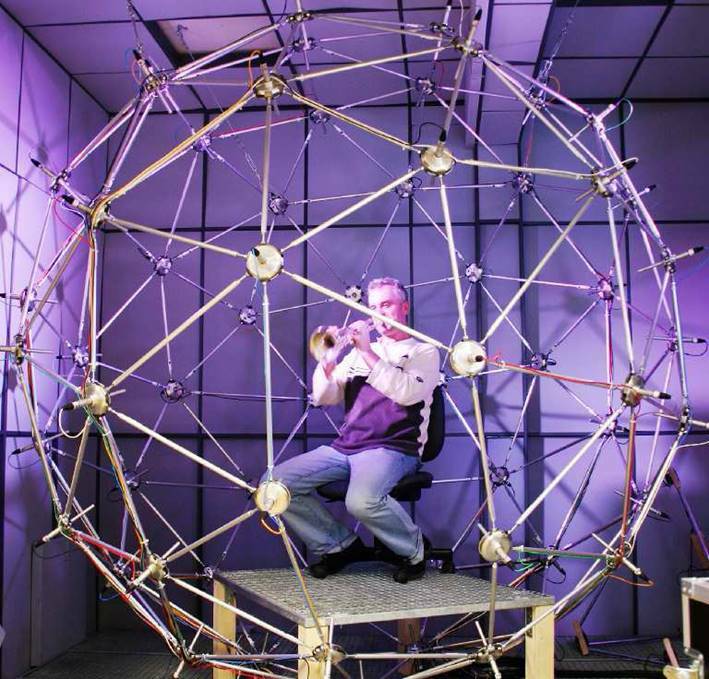 In the new millennium, researchers built surrounding spheres of microphones that allow to record a holographic sound image of any musical instrument (Figure 1). This was done to get a more natural representation of instruments in virtual acoustic environments for games or computer-aided acoustic design. Alternatively, the holographic sound image can be played back in real environments using a compact spherical loudspeaker array (Figure 2). Such a recording allows, for instance, to convey a tangible experience of how strongly the timbre and loudness of a trumpet changes with orientation. (Audio example 1) is an excerpt from a corresponding holographic sound image using 64 surrounding microphones. With each repetition of the excerpt, the recording position gradually moves from behind the instrumentalist to the face-to-face orientation. While what was shown above was done under the exclusion of acoustical influences of the room, the new kind of holographic sound imagery is a key technology used to reproduce a fully convincing experience of a musical instrument within arbitrary rooms it is played in. A surrounding sphere of 64 microphone was built at IEM (Fabian Hohl, 2009) to record holographic sound images of musical instruments. The photo (Fabian Hohl, 2009) shows Silvio Rether playing the trumpet. 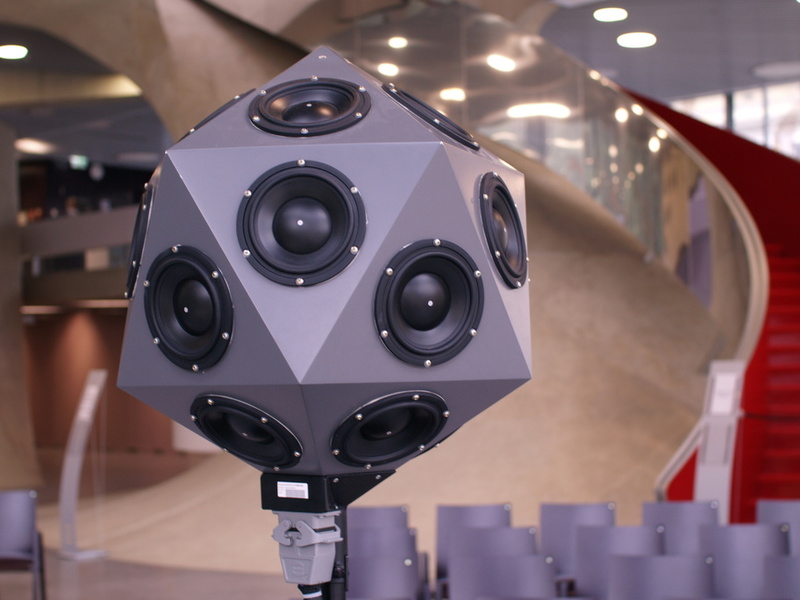 The icosahedron as a housing of 20 loudspeakers (a compact spherial loudspeaker array) was built 2006 at IEM. It is a device to play back holographic sound images of musical instruments. Currently, it is used as a new tool in computer music to project sound into rooms utilizing wall reflections from different directions. The photo (Franz Zotter, 2010) shows the icosahedral loudspeaker during concert rehearsals. In the example, one can clearly hear the orientation-related timbral changes of the trumpet. The short excerpt is played in 7 repetitions, each time recorded at another position, moving from behind the trumpet player to the front. The piece “Gaelforce” by Peter Graham is performed by Silvio Rether, and the recording was done by Fabian Hohl at IEM using the sphere shown in Figure 1.